AUSTRALIE – Narwala Gabarnmang – A team of University of Southern Queensland archeologists has uncovered Australia's oldest rock art. Professor Bryce Barker, who was working with USQ researcher Dr Lara Lamb, found the charcoal drawn fragment dated at 28,000 years after excavating a small part of a Northern Territory rock shelter site named Narwala Gabarnmang. The Narwala Gabarnmang site is among one of the richest Aboriginal rock art sites in Australia and one of the most extensive in the world. Material excavated from the site in June last year by Professor Barker and Dr Lamb was returned to the USQ archaeology laboratory for sorting and analysis. During this process, in October last year, Professor Barker turned over a fragment of granite stone and was stunned to find a piece of a charcoal drawing. 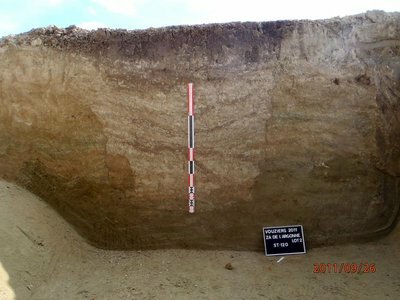 A specialist dating team from the University of Waikato radiocarbon laboratory took scrapings of the charcoal which subsequently turned out to date to 28,000 years ago. This process made it it the oldest firmly dated rock art painting in Australia and among some of the earliest evidence of human painting in the world. FRANCE – Vouziers - «Jusqu’ici, on avait très peu d'information sur la Préhistoire dans les Ardennes. Le site de Vouziers est donc très, très intéressant. » Estelle Bénistant, chargée du développement culturel à l'Inrap, ne cache pas l'importance des découvertes vouzinoises. Pour installer la ZAC Porte de l'Argonne, des fouilles archéologiques avaient été réalisées en 2011 à Vouziers par l'Inrap en mai-juin et août-septembre. 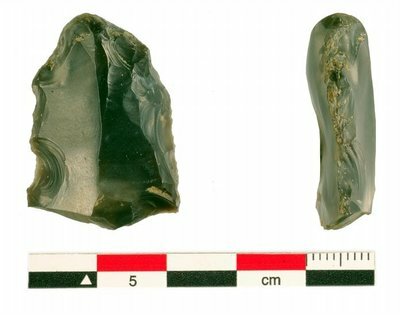 « Sur 1,9 hectare, ce sont des vestiges des périodes Mésolithique et Néolithique qui ont été mis au jour : silex taillés, outils et armatures de flèches utilisés par les chasseurs-cueilleurs du Mésolithique, annonce Sophie Bettig, chargée de la communication de la 2C2A (qui a réalisé la zone). Des bâtiments, des fosses, des restes osseux d'animaux et des graines de céréales consommées par les populations sédentaires du Néolithique installées dans un village ou un hameau ont également été découverts ». Sophie Galland-Créty et Bruno Duchêne, archéologues à l'Inrap, présenteront les résultats des fouilles et expliqueront le mode de vie de nos lointains ancêtres. « Ce sont de très anciens Vouzinois, confirme Estelle Bénistant. Certains n'étaient que de passage et c'est aussi la période des premiers sédentaires. » Grâce à un diaporama, les curieux découvriront cette « armature tranchante sur éclat de hache polie, réutilisée pour faire une flèche », témoin de la chasse à la période néolithique, ou ce silex présenté comme un briquet qui enflammait un combustible très sec, par exemple l'amadou, un champignon. Une fosse, découverte, posera l'énigme de sa création : piège à animaux, stockage de denrées alimentaires, puits ou tombe ? PAKISTAN – Shekhan - Archaeological artifacts have been discovered in the Shekhan area of Bara district, Khyber Agency. After finding some artifacts belonging to the Buddhist Civilisation, the digging was initiated in the area. The archeological artifacts were discovered during the construction of a mosque. ISRAEL – Azekah - Macquarie University student Matthew Williams will travel to Tel Aviv to excavate at the mound of Azekah. The site in the upper reaches of the Valley of Elah is near the biblical setting of the battle of David and Goliath. In ancient times, Azekah was an important border fortress and regional centre strategically located along the main route from the coast to Jerusalem. He will spend a month excavating at the site. The team will focus on uncovering the late Bronze Age lower city and tracing the fortifications of the Iron Age city mentioned by the Assyrian king Sennacherib. What it finds will help show what daily life was like in a border kingdom, how a regional centre worked and find out more about the royal administration of Judah. Mr Williams said the team will be looking for a 701BC "destruction layer". This includes looking for evidence of fire, smashed artefacts and siege ramps the Assyrians used to smash through city walls. ROYAUME UNI – Dowlais – The remains of a 253-year-old South Wales ironworks could soon be as important as Stonehenge. Dowlais Ironworks rose from humble beginnings as a partnership in 1759 to the might of the largest steel producer in the UK in the 1840s – employing 7,300 people. For the past two years, opencast miners Miller Argent have been excavating the site, and their work – has seen them shortlisted for the Best Project Award at the 2012 British Archaeological Awards. The ironworks, known to many as the Guest Keen Ironworks, finished production in 1987 when then owners British Steel shut it down. Miller Argent’s research has unearthed treasures from more than 200 years of the site’s history – including the complete excavation of the earliest ironstone pit head complex yet to be discovered in Wales and the excavation of an early mining settlement. Other remains include early patch workings and scourings, ironstone, settlement sites and elements of the Dowlais Free Drainage System, an arrangement of leats and reservoirs which channelled water to power the ironworks. The company plan to display the findings at an exhibition in the visitors’ centre at the Cwmbargoed Disposal Point, along with a site-side display. SRI LANKA – Fa-Hien cave - Archaeology Department of Sri Lanka has found a skeleton of a pre-historic man from the Fa-Hien cave archaeological site in Pahiyangala of Kalutara district. The skeleton is believed to be about 12,000 years old and belonged to the Homo sapiens species known as Balangoda Man. Director General of the Archaeological Department Dr. Senarath Dissanayaka has said that a full skeleton of the Balangoda Man was found during excavations of the Fa-Hien cave. This is the first time a complete skeleton of a pre-historic human was discovered, according to the official. Several other remains belonging to an older era have been found earlier from the site. These include two pre-historic human skulls that are about 37,000 years old. The cave has been known for late Pleistocene human skeletal remains discovered in the 1960s and 1980s.